I cannot say for sure whether I already saw a recumbent figure there beneath the dark foliage, before finding the protagonist’s name nested deep within the title. It’s difficult now to look at this cocoon of feathers and flowers without pondering who is entombed or entangled within. Its surfaces erupt in clusters of fabric flowers and black branches. Tucked amid the blooms, two small birds can be found; at one end of the form a velvet-clad branch pushes upward out of the dense canopy of flowers and foliage, supporting a spray of wiry twigs, dark blossoms, and peacock feathers, their vivid tones muted by a dusting of black spray-paint. Colors range from blue-black to plum to crimson — all the colors of a bruise. 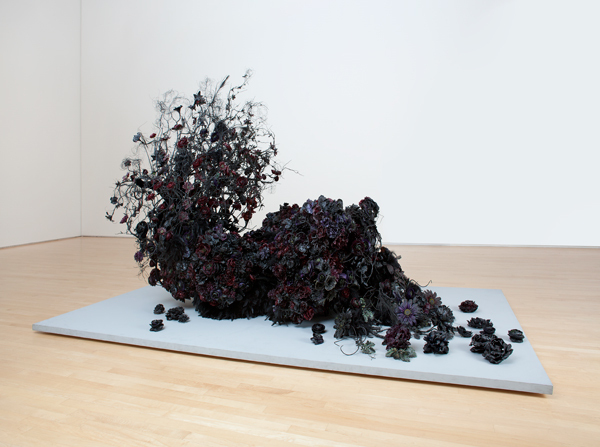 The work is Untitled #1181 (Dante’s Daphne), 2004–6, by Petah Coyne. Two poems are suggested in the (parenthetical) title Dante’s Daphne: the Divine Comedy and Ovid’s Metamorphoses. The artist is a great lover of literature and poetry, and when called on to talk about her own work, she will frequently invoke the authors and poets who inspire her. Taking her lead, I’ve chosen to explore the work in the context of these literary allusions, starting with Daphne. Ovid’s Metamorphoses comprises tales about divine transformations; people are changed into flowers and beasts, stone is turned to flesh. Many of these are born from mishaps and missteps of love and passion, and it’s as a result of unrequited affection that Daphne is changed into a tree. The Daphne of Ovid’s tale is a river nymph of exceptional beauty, and the god Apollo falls deeply in love with her. She has no interest in being wedded to Apollo nor anyone else, god or man, preferring simply to live in the forest hunting the wild elk. Undeterred by her indifference, Apollo pursues her steadfastly, chasing her through the woods, pleading. As he closes the distance between them and Daphne knows she will be overtaken, she calls upon her father, the river god Peneus, to rescue her from Apollo’s clutches. Peneus hears her call, and at once the transformation begins: bark covers her skin, her arms become boughs, and her flowing hair turns to leaves, while her feet take root in the earth. Leaf twined within her hair and she was laurel. The story ends with Apollo, his love unabated, decreeing that the laurel shall be the crown of glory for victors in war, sport, and poetry. But Daphne’s tale doesn’t entirely explain the thing before us: Coyne’s sculpture is not quite a tree, and certainly not a laurel. What’s here seems to possess a brooding intensity, or a sinister secret buried within it. As they pass through the wood Dante can hear voices whispering, and when he snaps a twig from one of the trees, it bleeds and cries. Through this fresh wound the tree speaks to the travelers, explaining who he is and what brought him to this fate: this is the wood of the suicides, where those who have taken their own lives are to spend eternity in this ghastly grove as gnarled, twisted trees. But would Daphne belong here, in the wood of suicides? Did she willfully forfeit her life, like the tree-imprisoned souls in the Inferno? And to what extent is Daphne’s story a tragedy? Certainly Apollo is bereft of the object of his desire, in much the way Dante pines for his departed Beatrice. But what should we make of Daphne’s fate? Whether her metamorphosis leaves her liberated or imprisoned is a matter of conjecture. The material vocabulary of Dante’s Daphne is one of life preserved or prolonged, the inanimate imitating the living, or embalmed in a mimicry of life. The artist has said, “I take things that have no value and breathe new life into them.” This statement seems to carry mythic and magical overtones, evoking the tales of antiquity in which primordial gods create men and monsters from mud. My soul would sing of metamorphoses. This theme, the quest for immortality, is also fitting to Coyne’s creations (her “girls,” as she likes to call them). She endows ordinary and tawdry materials with an eerie permanence, like fairy-tale heroines induced into eternal sleep, impervious to the time-cycle of growth and decay. Tim Svenonius is a producer of interpretive media at SFMOMA and a practicing artist. His artwork and other writings can be found at www.sacredbeast.net. Tim, your description of the tree bark overtaking the leg reminded me of another work in SFMOMA’s collection: Diego Rivera’s “Symbolic Landscape.” Any thoughts on this?